US Republican Senator Thad Cochran, who is seeking re-election, has narrowly beaten a Tea Party candidate in a high-profile primary in Mississippi. Mr Cochran, a six-term senator, had the backing of establishment Republicans but was forced into a run-off by Tea Party challenger Chris McDaniel. The race was seen as a crucial test of the direction of the Republican Party ahead of midterm elections in November. Moderate Republican candidates also won primary races in Oklahoma and Colorado. 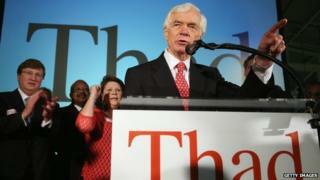 The BBC's Beth McLeod in Washington says Thad Cochran's victory, although narrow, will come as a relief for moderates who were faced with a challenge from hard-line conservative groups within the party. Earlier this month, establishment Republicans suffered the shock defeat of former House Majority Leader Eric Cantor by a little-known Tea Party challenger in his Virginia district. In a brief speech, Mr Cochran thanked those who supported him. "It's a group effort, it's not a solo, and so we all have a right to be proud of our state tonight," he said. The 76-year old is expected to retain his seat in November's congressional elections. Mr McDaniel made no official concession, complaining of "dozens of irregularities". "We had a dream and the dream is still with us," he told supporters on Tuesday. "Today the conservative movement took a backseat to liberal Democrats in Mississippi." Mr Cochran had reached out to African-Americans and others who are traditionally Democratic voters in the state. Those who had not already voted in the Democratic primary several weeks ago were eligible to vote on Tuesday. The election was one of the most expensive primary fights this year, with $11.4m (£6.7m) in outside spending, according to The Hill newspaper.